We consider steady compressible Navier-Stokes-Fourier system in a bounded two-dimensional domain. We show the existence of a weak solution for arbitrarily large data for the pressure law p(ϱ, ϑ) ∼ ϱ γ + ϱϑ if γ > 1 and p(ϱ, ϑ) ∼ ϱ ln α (1 + ϱ) + ϱϑ if γ = 1, α > 0, depending on the model for the heat flux. The work of M. Pokorný is a part of the research project MSM 0021620839 financed by MŠMT and partly supported by the grant of the Czech Science Foundation No. 201/08/0315 and by the project LC06052 (Jindřich Nečas Center for Mathematical Modeling). J. Frehse, M. Steinhauer, W. Weigant: The Dirichlet Problem for Steady Viscous Compressible Flow in 3-D. Preprint University of Bonn, SFB 611, No. 347 (2007), http://www.iam.uni-bonn.de/sfb611/. A. Novotný, M. Pokorný: Steady compressible Navier-Stokes-Fourier system for monoatomic gas and its generalizations. J. Differ. Equations. Accepted. 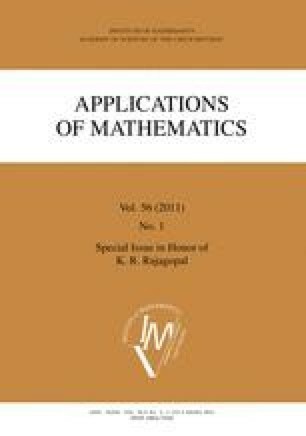 See also Preprint Series of Nečas Center for Mathematical Modeling, http://www.karlin.mff.cuni.cz/ncmm/research/Preprints/servirPrintsYY.php?y=2010. Preprint No. 2010-021. A. Novotný, M. Pokorný: Weak and variational solutions to steady equations for compressible heat conducting fluids. Submitted. See also Preprint Series of Nečas Center for Mathematical Modeling, http://www.karlin.mff.cuni.cz/ncmm/research/Preprints/servirPrintsYY.php?y=2010. Preprint No. 2010-023.